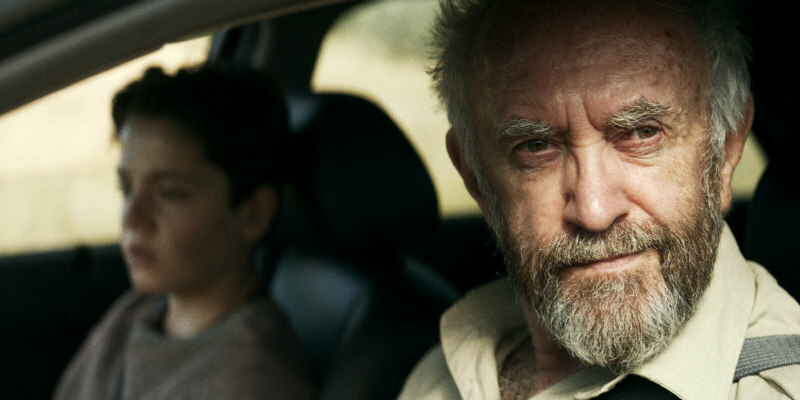 Welsh born Jonathan Pryce is one of the best loved stage and screen actors in the UK. His most recent role is in upcoming drama The White King, which is based on the critically acclaimed and award-winning novel by György Dragomán. Set in a fictitious dictatorship in the near future, the film explores what the world could look like after a societal collapse. We focus on one family's life under the oppressive regime; following 12 year-old Djata (Lorenzo Allchurch), whose father is forcefully imprisoned. As they are preyed upon by secret police, Djata and his mother (played by Agyness Deyn) are forced to navigate a world of propaganda, abuse and vicious gangs, as they risk everything to reunite their family. Pryce plays Colonel Fitz, Djata’s grandfather, who may hold key information about his own son's abduction. Pryce’s role in Brazil was written with him in mind, years prior to the film's production. Originally the character was planned to be in his mid-twenties but after the film was in limbo for several years the character was altered to late thirties so that Pryce (aged 37 at the time) could play the part. Set in a dystopian future, the film tells the story of Sam Lowry, a civil servant in an Orwellian society. After attempting to correct a wrongful imprisonment, Sam meets a woman he has been dreaming about and becomes an enemy of the state and branded a terrorist. The film was praised for underscoring serious ideas with satire and fantasy. This incredibly well received film depicts two days in the lives of four real estate salesmen. They become desperate when the corporate bosses send in someone to motivate them, who warns them that all except the top two salesmen will be fired at the end of the week. The film was adapted by David Mamet from his award-winning play of the same name. Much like the original play, the film is notorious for its use of profanity. Glengarry Glen Ross was commended for its clever script and powerhouse actors, including Pryce who played the same role on the stage. Another film adapted from the stage, Evita saw Jonathan Pryce take on the role of Juan Peron opposite Madonna. The musical tells the story of Eva Peron, who starts life as a poor young girl that goes on to become an actress and then the wife of the Argentinian President. The story of love and politics sees Eva Peron rise from poverty to become a heroine to the people of Argentina. The film struggled to gain permission to film at the Casa Rosada (the office of the President of Argentina) until at a meeting with the cast, where out of time constraints, Madonna asked “Let’s cut to the chase here. Do we have the balcony, or don’t we?" The then-president Carlos Menem finally gave his personal permission. In the eighteenth installment in the James Bond series, Pryce starred as the main villain opposite Pierce Brosnan. The film followed James Bond’s attempt to stop a media mogul named Elliot Carver who plans on engineering world events to initiate World War III. Shooting began on 1st April 1997 but at the time Jonathan Pryce had still not yet been cast in his role as the film’s antagonist. The film was initially titled Tomorrow Never Lies, but a typo on an early script draft was adopted by the producers and the film became Tomorrow Never Dies. Jonathan Pryce joined the cast of the immensely popular HBO television show for the fifth season. Pryce took on the role of the High Sparrow, the leader of the militant faithful. The character became well known for being mysterious with regards to his intentions and brought a refreshingly new, different religious point of view to the series. Pryce was originally offered a role in 2011 for the first season, but he turned it down as the genre didn't appeal to him. However, Pryce eventually took his now well known role as the High Sparrow from season five.